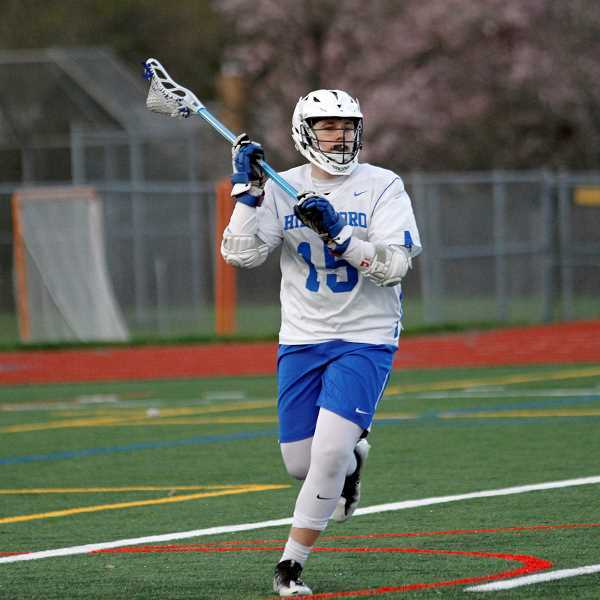 Entering his fourth season as head coach of the Hillsboro High School boys lacrosse team, Carl Almquist has seen a lot. The former lacrosse player at Portland State University understands what it takes to build a successful program, and having started from scratch with the Spartans a few years ago, he's starting to see the fruits of his labor on the field — even if not quite yet in the standings. The Sparts dropped a game to McNary 9-5 this past Wednesday, April 3, at Hillsboro High School, and in the process fell to just 1-4 on the season. But while not the result he and his players were hoping for, it was another step in what he hopes will be a winning process not too far down the road. "It could've gone better in regards to how we were planning on it going," the coach said. "We have a lot of talent on this team, but we still have a big gap we're trying to fill from losing a few key players from last year, and as a result trying to build the chemistry needed to win more regularly." Unlike other programs that have a history of winning, or really even history at all to lean on when it comes to setting and meeting standards, Hillsboro started with a blank slate. But Almquist said his team — as a result of some, albeit minimal team and individual success in recent years — has finally reached a point of awareness pertaining to what's necessary to win, and due to such has standards which in past years failed to exist. "Our guys definitely do have a standard and this is the first time in my four years here that the team sees that there are standards for them to meet," Almquist said. "We've had kids that have gone on to play in college and the guys want to make some noise as a team in the state. It's exciting, but at the same time that's what's making this year a bit of a challenge because our new and veteran players want to become a competitive team." Unfortunately those standards and that desire hasn't yet led to wins, with losses to Mountainside, Mt. View, Sisters and most recently McNary, while boasting just a 17-11 win over Corvallis. But while frustrated in defeat, Almquist understands that his "diverse" team of young and older talent needs time to develop the chemistry necessary for positive results on the field of play. "One of the biggest things that cost us last night is were still working on team chemistry," he said. "There's also a sense of character were developing. Even though we have six seniors, we still have guys that don't quite have the lacrosse IQ to make them quite the asset they could be to the team." The Spartans are led by senior Noah George, along with senior goalie Garret Moore who's committed to play next year at William Penn University in Oskaloosa, Iowa. Almquist said that both have been invaluable assets to building the program, and have come a long ways while staying loyal to the club despite options to play elsewhere. "Noah has been with me all four years of high school and has developed a love of the game," Almquist said. "He's had several opportunities to go play for other teams, both in club and at high schools that have tried to encourage him to seek a transfer, yet he's stuck with me and us." The coach said that — while cliché — his approach for the team is one step at a time, one game at a time, and believes that if they continue in the same vein, they can live with whatever results come their way. And how does he feel about their progress to this point? "It's exciting to see how far we've come," he said. "We've gotten here over the last four years, now we need to take that next step."